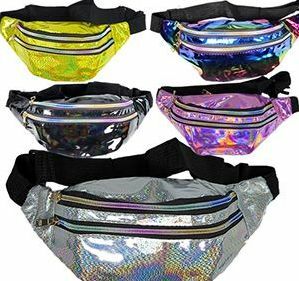 HOLOGRAPHIC PRINT FANNY PACKS. Made of sturdy vinyl to keep the contents dry, these versatile waist packs have 3 zipper pockets- 2 in the front and one in the back for added security. The woven waist band expands from 35 to 49 inches. Perfect for travel and dress up. Assorted colors. Sorry, no color choice available.